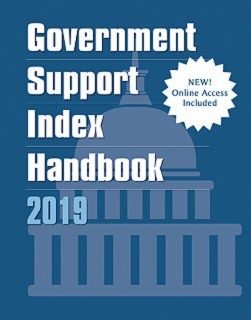 Government Support Index Handbook provides encyclopedic entries of all domestic programs that offer financial and non-financial assistance from federal agencies, and helps readers distinguish which programs are administered to the public via local offices, from those administered from the federal agency headquarters. The book includes 1,892 federal programs that are summarized from data contained in the Catalog of Federal Domestic Assistance (CFDA), maintained by the General Services Administration. It provides a profile of each program that condenses over 3,000 pages in the CFDA to just the essential details. This comprehensive resource includes a one year subscription to Omnigraphics’ interactive database Government Support Index. Users can discover programs and agency contacts by federal agency, award types, applicant/beneficiary eligibility and subject of need. It also includes a keyword-driven search that complements the book. Additional program details are given for each program and organized in a thoughtful and procedural way as to guide the user through the search and evaluation of programs, eligibility, and application procedures. User-centered search that locates and retrieves public assistance programs that match need-based purpose. Program discoverability based on applicant eligibility, beneficiary characteristics and application deadlines. Identification of additional program attributes such as fund status, accomplishments, fund size, assistance and program types. Family tree of department, agency, regional and local offices with current contact details. Financial charts and tables of program funding history.